Important: Once purchased, please allow up to 72 hours (at busy times and weekends) to receive email instructions for the digital download. 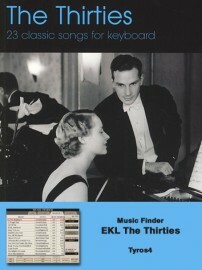 This pocket-money Music Finder file contains Music Finder titles and One Touch Settings settings for the 23 songs in the popular keyboard music album 'Easy Keyboard Library - The Thirties' (available from many good music retailers). A Fine Romance, A Foggy Day, All Of Me, Body And Soul, Easy To Love, Exactly Like You, For All We Know, Glory Of Love, I Wanna Be Loved By You, I've Got You Under My Skin, Keep Young And Beautiful, Lazy Bones, Moonlight Serenade, Over The Rainbow, Smoke Gets In Your Eyes, Stormy Weather, Summertime, The Lady Is A Tramp, The Way You Look Tonight, Walkin My Baby Back Home, What A Difference A Day Makes, When Your Old Wedding Ring Was New, You Go To My Head. Download the Music Finder content onto your computer. It arrives in a zipped folder. Extract the files from the zipped folder. The PDF information sheet can be opened on your computer and printed for reference. The Music Finder file - ‘EKL_Thirties’ should be copied to a USB stick. Copyright Devellion Limited 2014. All rights reserved.